You may have picked up on certain clues that I, the SheppyBrew Brew Master, am a Chicago Blackhawks fan. 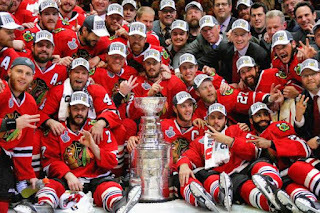 You probably know that the Blackhawks just won their third Stanley Cup in 6 years after having gone 49 years without winning any. I hardly know what to do with myself. I do know, however, that I want to make a beer to help celebrate the wonderful accomplishment. If you are a Chicago Blackhawk fan, or just happen to watch the Blackhawks from time to time, you know that when the Hawks score a goal, the United Center plays part Chelsea Dagger by The Fratellis. In the playoffs when the team is on the road, I play Chelsea Dagger after goals since obviously the team that the Hawks are visiting won't do it for them. Generally speaking, I am not a superstitious person, but if I think the team needs a "lift", I will play the song too. We hear a lot of Chelsea Dagger during the playoffs. And, not to brag, but the results speak volumes. Since I've started helping the team with the song, they've won 3 cups in 6 years. Since 1926, they've only won a total of 6. And what style would a fine upstanding lady like Chelsea drink? Well, I'm thinking an American Pre-Prohibition Lager would do the trick. As a totally unrelated bonus, it gives me a start on brewing styles in the new 2015 BJCP Categories. (Category 27 Historical Beer). I told myself that if this beer turned out well, I'd have to brew some more for the 2016 playoffs! And it turned out awesome. This is the first time I've used Cluster hops and it turns out that I really really like them. The beer came out hoppier than any other pre-prohibition lager I've ever had, but I really really like it that way. Yum! For for about Chelsea Dagger on the blog, see Sheppy's Blog: Chelsea Dagger. Make a starter a day or two before brew day. Brewed today. Everything went fine. No complaints. Going strong. Need to add blowoff tube. Kegged yesterday. Sample tasted awesome. Love the Cluster Hop flavor. 1.008 FG puts this beer at about 5.2% ABV. Perfect. Chilled outside overnight. Now in the kegerator. Pour from keggerator tap. Delicious hoppy beer. Obviously needs more carbonation. Delicious beer. Carbonation is getting there. Cluster hops give this beer a fruity flavor. Have not had a bunch of this lately because I'm concentration on the Pumpkin and X-Mas and Cubs Win beers. The tastes I have had have been wonderful. Carbonation is where it should be. Once the holidays are over I'll be drinking much more of this. Fantastic beer. Crystal clear. Hops not as intense as they were, but still delicious.